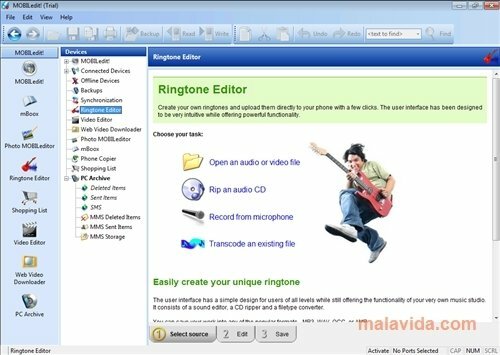 Managing any mobile phone or smartphone from our computer is absolutely brilliant, and as we have normally got our mobile phone beside our computer when we are using it, many times connected by means of Bluetooth. What better than an application to access our phone from our computer? 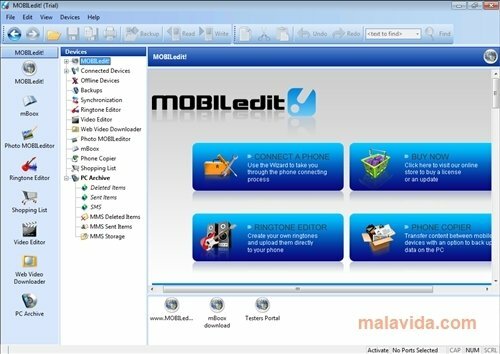 If this is what you're looking for, MOBILedit! is for you. Among the hundreds of telephone and smartphone models that MOBILedit! supports, we'll find makes like Nokia, Motorola, Sony Ericsson or Samsung, that are the current biggest companies on the market. In truth, all the mobile phone operating systems are supported, from Symbian to Android, and taking into account that many of the manufacturers have similar applications, MOBILedit! is already prepared no avoid conflicts. Furthermore, it's possible that MOBILedit! works on other terminals that aren't listed, but if you connect your telephone and it works, they encourage you to let them know. With MOBILedit! you can make backups of anything that is on your phone, and it's even possible to control some models to send and read SMS, answer calls, install and uninstall programs and games, create tones and it's even possible to download videos from YouTube and transfer them to your phone.